the church as the public of the Spirit, made know in the community defined by its center (Christ) rather than boundary (239). Proclamation has a primary role as a means of Christian witness, because its proper practice is demonstrative of the offer it extends. Conversion does not occur in a moment of decision but through the “acquisition of a way of life that is embodied and passed along in community” (259) also known as “the formation of Christ in believers” (260). 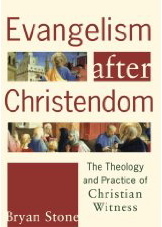 The false connection between conversation and church growth is rooted in the Christendom paradigm; faithful witness has no causal relation with numerical increase (271). Instead, faithful witness is measured by “whether it is offered to all or only to some” (273). Virtue is both a habituated disposition of character and a gift from God, and it is both the means and end of evangelism. Virtue is known foremost through exemplars such as martyrs, who’s suffering is related to their virtue only as the occasion upon which it became visible in its full beauty. Four virtues critical to the contemporary practice of evangelism include presence, patience, courage and humility (284) because “the Christians who evangelize are more important than the methods they use” (316). Stone’s description of conversion is constructively holistic but under represents the role of the will in its progress. Indeed, conversion is far more than a decision or an experience but neither is it mere socialization as Stone admits, but continues to point to. Holistic holiness of “heart, mind, body, relationships, allegiances, habits” is only possible through relationships that share these ends but none of these dimensions of the self can be made holy accidentally or by mere association, as Stone wonders (266). One might have their mind or relationships partially converted as a result of belonging within the ecclesia, but holistic transformation is dependent on the conversion of the will itself, consciously or not, to the desire of dwelling within the world that Christian witness has opened to them. This will-conversion is the gift of God that makes conversion of the whole person possible. It comes almost exclusively through the witness of the church and leads to participation in the practices of the church toward their proper end. Stone draws a distinction between “deciding to believe” and “having a conviction” that leaves the reader wondering what it would mean for someone to choose to believe (262). What one believes is not directly an exercise of the will. One may decide to act as if God exists—though they do not believe it already—and in so doing come to believe that it is so, but one does not choose this belief directly. The will cannot sustain choices that contradict beliefs. Inevitably, actions will be manifestations of beliefs and these actions will form habits and character appropriate to the belief. Thus belief and conviction are one in the same and not necessarily connected to either choice or, incidentally, profession.